Happy Workout Wednesday guys! Today on Fox News 46, Im giving you travel friendly workouts that you can do with a mini band. If you don’t already have one they’re about $10 and can be found in a lot of places like, Marshalls, Target, Walmart or amazon.com. Mini resistance bands are great for working the muscle tissue thats deeply set around your joints which keeps your body stable, tight & firm and the high rep, low resistance style workout will have you working up a sweat and therefore burning fat. So join me in this low resistance meets cardio type of workout! You guys ready?! Embrace the burn and GO! Move slowly and with control in this move. Your lt. knee should pass right under your lt. hip on the way in and out. 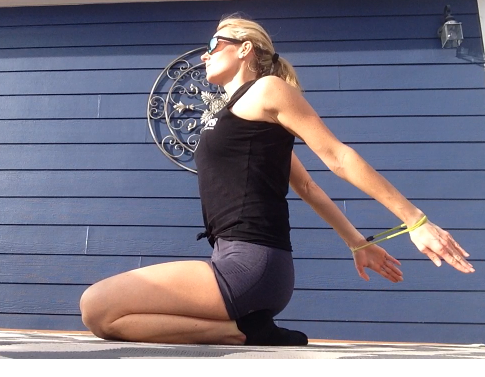 Keep lt. leg locked out and foot flexed as you lift up, then out to the side, back in and down. Thats one rep.
Push through heels and lean back slightly as you pull back on band. keep elbows locked out and lift arms as high as they’ll go without bending the elbow or rounding shoulders forward.